Fans of The Flash didn't want to believe it, but the midseason finale showed Barry Allen outsmarted by The Thinker - and facing a prison sentence because of it. The morality or conscious of Barry Allen is still clear, so no concerns over our hero being pushed to do the unthinkable and actually kill the newest enemy to threaten his friends and family. In fact, the master plan of The Thinker is still largely a mystery. But whatever his endgame, it begins with Barry Allen being locked up for murder. Like father, like son, we suppose. That's the way it's being set up, at least. It seems like just last week that The Flash helped beat the Nazis of Earth-X, and now he must come home for the holidays... just in time to face a far more real-life threat. 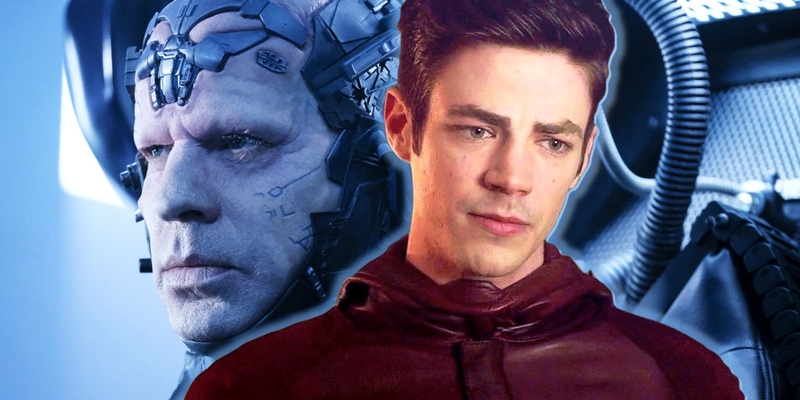 Whether The Thinker's plan is to put an end to Barry Allen's superhero career, or isolate him from his friends and Central City residents for his REAL master plan isn't clear. All we know is that when The Flash returns for the second half of its season, Barry Allen had better find himself a good lawyer. When the midseason finale was revealed to be titled "Don't Run," it seemed at odds with the show's most famous (infamous?) tagline. Or it could have been taken as a positive: to defeat The Thinker, Barry Allen would need to trust in his own metahuman intellect, and think, not run. In reality, the words will now live forever as Barry's most shocking - and possibly, most intelligent - surrender. Because when the police comer breaking down your door ready to witness a murder scene, the best thing you can do is admit that you've been beaten. For the moment, at least. It's clear that The Thinker's plan has been months, if not years in the making, but the final piece may have been contained in this very episode. In an earlier scene of wedding gift-opening, Barry notes one package that has no card attached. The mystery gift is a set of knives-- well, it was set of knives, but only one remains. We would wager a guess that the other knife is the one laying bloodied next to the body of Clifford DeVoe... having likely been used to cut the hole in his chest. Needless to say, things don't look good for Barry. But then, losing a single battle doesn't mean that the war has lost. So even if DeVoe has won this round, we have to believe that Barry has a trick or two up his sleeve. When it was first revealed that the villain of The Flash season 4 was going to be The Thinker, and not another speedster, all involved were hopeful. Not that the prior speedsters had suffered due to their power, necessarily, but that it would allow an injection of new stories, threats, and paths to victories. With the midseason finale now underway, the show may have delivered in more ways than expected, and in different ones, too. And swapping the villains from one actor to another midseason is just the most obvious way to rejuvenate the series. From a fictional standpoint, The Thinker's ultimate 'trick' helps comment on the very fact that The Thinker - a super genius - couldn't help but seem suspicious. In the story, that was all intentional, meant to give Barry just enough of a clue to begin spinning out of control. Fast-forward a few weeks, and suddenly a citizen is found dead, in the apartment of the criminologist who had broken into his home convinced of his guilt. And murdered with one half of a knife set given as a wedding gift - the other knife, presumably, covered in Barry's fingerprints. Yet as the scene draws to a close, it's hard to miss the few seconds Barry spends observing the blood splatter, the weapon, the position of the corpse, and who knows how much more before deciding: "don't run." Was Barry weighing the evidence and the case he could make? Will The Thinker prove a master of even Barry Allen's field of science? We will all know in a few short week. For now... we can't help but give credit to the one villain able to truly trap Barry Allen. Not in some cage or pseudo-scientific force field: but in the very law he serves. A nice touch.